Motorcycles inspire feelings of nostalgia, sentimentality and freedom from the restrictions of a normal life. The decision to sell a motorcycle is a hard one, but sometimes it’s necessary to take that next step. If you’re going to part with your favorite machine, make sure you get a fair price for it. Here’s how to sell a motorcycle for as much money as you can get for it. If a buyer knows more about your motorcycle than you do he or she is at a big advantage. Even worse, your buyer will start to doubt your credibility on the maintenance of the vehicle. By being able to communicate the attributes of the motorcycle, along with sharing first hand experience with it, a seller can clearly explain the benefits of his/her motorcycle and make them easy to understand. Ownership – the legal document with your name and the motorcycles VIN #. Used Vehicle Information Package – this is a document in Ontario which has information such as the list of previous owners, title status of the vehicle (clean, salvage, write-off), and more. This document will change names based on the state or province. Bill of Sale – samples can be found online, but at a minimum the bill of sale should clearly state the date, the VIN#, the purchase price, the name of the buyer and seller, and their signatures. Safety Certification – Vehicles can be sold either in “as-is” condition, or certified by a mechanic. Generally a certified vehicle can be insured and then plated immediately, but a vehicle sold “as-is” must be certified before it can legally be put on the road. Certified vehicles also inspire more confidence in shoppers, as your bike will have to be inspected by a professional in order to get certified. Thus, vehicles being sold certified can often sell for a bit more than those sold as-is. Past History – Whether you’ve maintained your motorcycle at a dealership, garage, or yourself, you should have some receipts for service and parts. These will prove to your buyer that your motorcycle has been as carefully maintained as you say it has. Various miscellaneous – Extra keys, owner’s manual, spare parts, service manual, etc. List your bike in every form of free classified you can. Kijiji, Craigslist, Trader, local niche sites, get your motorcycle listed everywhere. Want to reach an even wider audience? Bring your bike to a local motorcycle meet and throw a “FOR SALE” sign on the seat. When it comes to test rides, use a “test rides only with cash in hand” policy. If a rider wants to test ride your bike, let them, but hold on to a sum of cash that you agree on, and will return when they bring back the bike undamaged. Not everyone can have cash available on short notice. If it makes the difference between having or losing a sale, I will take a cash deposit, on agreement that the buyer will pay out the remainder by a set date. You can also have them receive a partial payment receipt, similar to the Bill of Sale. The document should contain all of the info previously mentioned under Bill of Sale, plus a mention that they’ve left a non-refundable partial payment for X amount and have Y amount outstanding, with the outstanding balance to be paid on a specific date. This protects both the buyer and the seller, so you should each have a copy. Share the history, condition, and modifications. Upload at least five pictures. This will save you from having to waste time emailing people more pictures individually. People gravitate towards advertisements loaded with pictures, and they want to really see the bike before going out of their way to see it in person. So paint an accurate picture to sell your motorcycle. The fewer surprises your prospective buyer has when he/she sees your motorcycle in person for the first time, the happier your buyer will be. More often then not, modifications are a sunk cost as soon as you want to sell your motorcycle. Spending thousands of dollars boring out an engine or doing a half dozen dyno runs and custom tuning does not increase your motorcycle’s value at a $1:$1 ratio. To buyers, deviations from stock translate into a potentially less reliable motorcycle. The bike may have a bit too much of the previous owner’s personality for a new buyer’s taste. Your modifications are great. They’re an expression of you, and of your wants and needs from the machine. But your mods are like a fine custom tailored suit. Unless you find someone with the same taste and size as you, your mods hold no value. Price your motorcycle accordingly. I spent weeks trying to sell this 2007 Harley-Davidson Sportster. Summer turned to fall and as it began getting colder and colder I knew there was no way I could get $6,000 for my Harley. The bike came with saddlebags, an extra seat, an extra gas tank, a windshield, and other extra parts. I took everything non-essential off of the bike, re-listed it for $5,500, and sold it two days later. Then I sold the extras separately for an extra $800. I ended up ahead of my asking price. You’ll get plenty of low-ball offers. 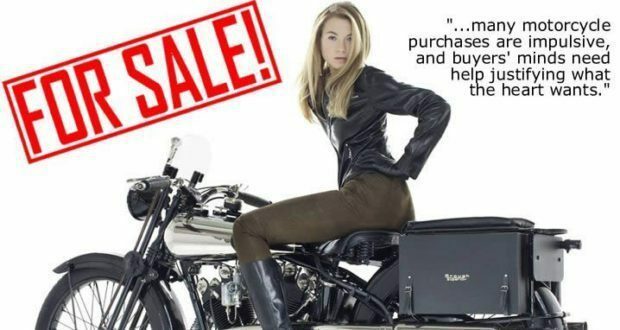 In most cases these offers are out to lunch, offering you pennies on the dollar for what your motorcycle is worth. But it works both ways. Plenty of buyers are completely clueless when it comes to what his/her motorcycle is really worth. To get a realistic sense of the value of your bike, look up what other motorcycles of the same model and approximate age and mileage are going for in your local classifieds. You can even reach out to other sellers and ask them what kind of offers they’re getting. Is your buyer looking to make a logical purchasing decision? If so, talk about the practical features of your motorcycle and its purchase. 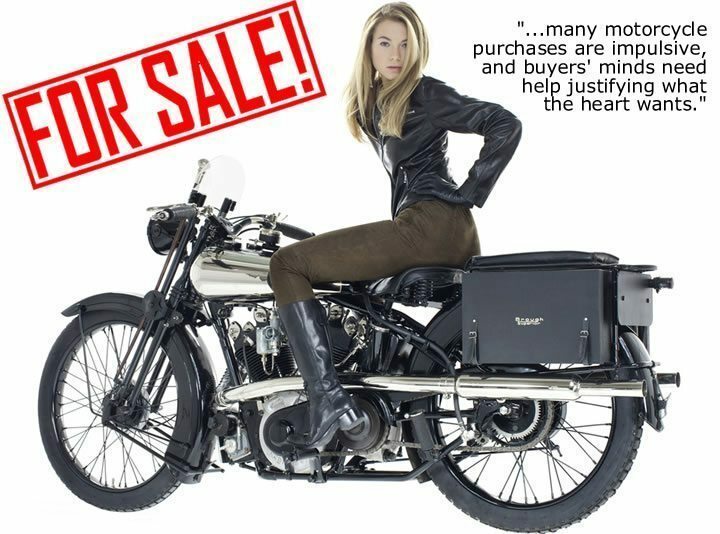 On the other hand, many motorcycle purchases are impulsive, and buyers’ minds need help justifying what the heart wants. Recognize your buyer’s motivations and make your vehicle relevant to them. This might also mean leveraging something really different about your bike. If you’ve traveled all over the country or internationally on your motorcycle, and it’s well suited to the task, consider listing your bike for sale on the ADVRider forum. You could also look for niches in your motorcycle types. Examples would be listing an Aprilia for sale on ApriliaForums.com or listing a cafe racer for sale on caferacerforsale.com. Above all else, have fun. Make selling your motorcycle an enjoyable experience both for you and for your buyer. Still not working? Check out these unconventional ways of selling your motorcycle for some less traditional tips. Thanks been a great help. Stopped me from going overboard with extras just to get my bike sold. Good pictures with solid written ads sell. I’ve seen so many ad’s with little to no information about the bike which have blurry, sideways, too close and 9 pictures in a row of the same side and angle of the motorcycle that just makes me wonder how they held down a job long enough to afford that bike to begin with. Personally, I start with a basic template that has tons of information on the bike. Including the good and the bad. And like this article says, don’t focus on the add-ons or mods. Also take plenty of pictures from multiple angles on both sides. I have recently ditched the adequate cell phone camera for the much nicer slr camera and often get top dollar, quickly for my bikes. My husband had a back injury several years ago. Followed by back surgery. Hung on to his bike, but couldn’t ride it for 2 years. It is currently not inspected, not registered, no insurance, etc. But the bike was garage kept and is in beautiful condition. I don’t even know if it starts. He wants to sell it but has no motivation to even make sure it starts. Could you tell me how to go about selling it with all this information? I don’t drive cycle, so I’m not much help but I don’t want to be taken advantage of in the sales. Like I said, it’s in great condition. My husband always by quality in everything and used to take good care of it. Any advice? Is there a time limit when you sell as is to a person where they can safety the motorcycle in Ontario, or can they wait as long as they want to or until they can certify it. No limit as far as I am aware. But I would recommend that they at least transfer ownership into their own name asap to avoid potential future problems. Depends a lot on what bike you have, on how fast it will sell. I know I posted a good condition Honda Shadow online for two weeks and got plenty of views but no inquires. Took seceral high quality photo’s and gave plenty of information. Sometimes people are looking for something for nothing because that’s all they have. Sure you want a bike, but have no money up front to buy one. Its why they probably go get a loan for a new bike. Its easier and less hassle. Sadly the fastest way to sell a bike is through a wholesaler who will offer a price, pick it up and hand you a check. Sure you get less for the bike, but its off your hands and onto something else. It probably would’ve helped to post it on more than one site, and in particular, on a more local one rather than a more broad one. Lot of ways to sell a bike. From ads in trader magazines, to social sites, to dealer commission deals and local ads. Less people shopping for motorcycles these days, younger people seem to have lost interest. Some just don’t have the money, some live in areas where ridding season is pretty short. God forbid you have a scooter to sell, those are basically worth nothing these days. Second year I have put my bike up for sale, yeah I get leads and people inquire. Even talk about seeing the bike or even buying. That’s about as far as it goes, because they either have no money, or they lose interest in buying a bike. Some probably just buy new and deal with less money up front. Even dealers have new models around from two years ago around here. Stock is just sitting around because less people want to ride bikes. Roads are bad, motorists are hitting bikers more and so its become less attractive activity. Yep. I find those who are in urban cities are able to sell. I have a relative in a more rural area who’s asking me to sell his bike for him in the city because he got interest last year, but no one wanted to make the drive out to see him. Everything but #4. No partial payments. Hmm, not sure I agree with that. I’ve had lots of people leave a deposit and come back and pay the remainder… I’ve also had lots of people not leave a deposit, tell me they were going to bring the money in full tomorrow, and either disappear off the face of the earth, or come up with a lame excuse why they couldn’t do the deal. I like taking a deposit. Partial payments have never failed me. No deposits have.